Pascal Jürgens, Andreas Jungherr and Benjamin Heitmann (2009) ‘The Interplay of Theory and Observation: A Proposition for Structured Research on Human Behavior on the Web’. In: Proceedings of the WebSci’09: Society On-Line, 18-20 March 2009, Athens, Greece. The attempt of Web Science to develop a deeper understanding of human behavior on and with the web, as practiced today, struggles to transcend the stage of isolated case studies of individual phenomena with little or no connection to the nature of human behavior as a whole. The authors believe this state can be remedied by a more conscious combination of theoretical concepts of human behavior and empirical work. 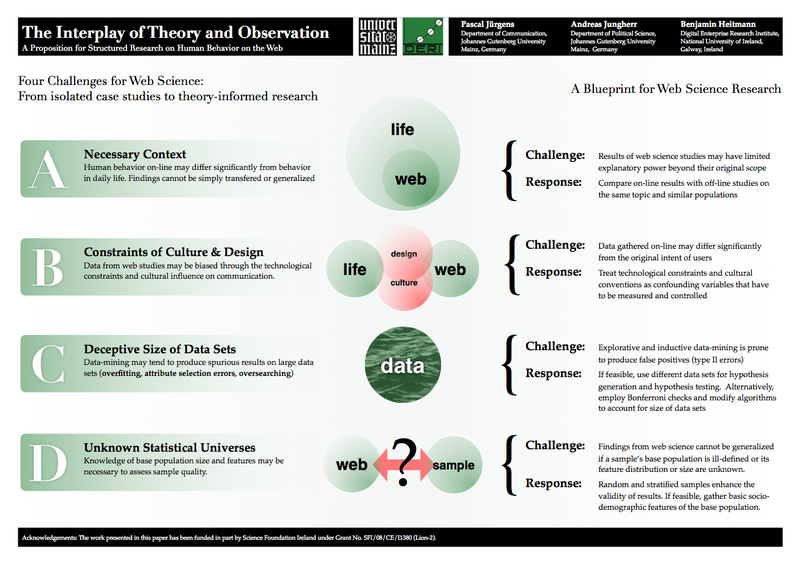 To this end this paper identifies four key challenges in sound Web Science: A – Providing theoretical context for studies, B – addressing the role of technological design and communication culture, C – dealing with large data sets and D – charting the web so research can be placed within. We then propose a blueprint for research practices which is based on the school of critical rationalism and serves to increase a study’s contribution to the field of web science. This is the poster version of the paper The Interplay of Theory and Observation: A Proposition for Structured Research on Human Behavior on the Web which Pascal Jürgens and Benjamin Heitmann presented in early 2009 in rainy Athens at the WebSci’09: Society On-Line. For the paper have a look at this pdf at the online proceedings of the conference. There you can also take a closer look at the poster itself.